Ed Becharian, a Florida resident, is trying to recreate a spicy fish rub recipe once handed down to him by his mother. 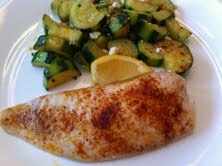 For Ed’s request, I suggested using the spices on a mild-flavored fish, such as tilapia or any white fish. The fish can either be baked, broiled, grilled, or fried. A recipe for ‘Spicy Baked Fish’ follows the spice recipe. Once you’ve created the spice mixture, place it in a jar with a tight-fitting lid and store it in a pantry or cupboard. This should keep for about 2 to 3 months. Be sure to stir or shake the spice mixture before using in order to redistribute the ingredients. Mix all of the ingredients together until well-blended. (NOTE: To be sure there are no lumps, you might want to sift the spices before adding the oregano.) Place in a jar with a tight-fitting lid and store in a cool, dry place for up to 3 months. Stir or shake mixture before using. 3. Spritz a 9x13x2 inch baking pan with vegetable spray. Place fish in prepared pan. 5. Bake, uncovered, until fish flakes easily with a fork, about 20 to 25 minutes. NOTE: Amount of baking time will depend on the thickness of the fish. Thin fish bakes quickly! my grandmother had a rub as well, she smeared it on the fish after it was cooked, her cooking method was outside. fish with wooden steaks through it and place in the ground side up facing the fire. the rub had paprika, yellow curry, salt, pepper, ground coriander, tomato paste, tamarind paste, smashed garlic lots of it, mixed all together like a thick milk shake. and so it went on fish and she let it rest before serving oh my goodness we ate with our hands along with rice and salad. I think she called it MAZGOOF. don't know if its Armenian but it was made by my grandmother so its Armenian to me. That sounds amazing, Shant; thanks for passing this along!